The United States government is actively monitoring terrorist cells affiliated with Osama bin Laden's al Qaeda network in eleven cities, from Florida to Boston to Denver to Houston. But al Qaeda is hardly our only threat. Hamas, formed in 1987, was run by top Palestinian officials in America from its earliest days, and has tentacles in Texas, California, New Jersey, Virginia, and Illinois. The University of South Florida was infiltrated by the infamous organization known as Palestinian Islamic Jihad -- one of its faculty members even left the country to take that group's top leadership role after his predecessor was assassinated. Hizballah has been tied to cells in North Carolina and Michigan, from which it drew funds and attempted to procure military equipment. In short, September 11, 2001, was hardly an isolated or unpredictable event. The United States has become home to hundreds and probably thousands of terrorists, and it has become a central node in their international networks. Steven Emerson, hailed as "the nation's leading expert on Islamist terrorism," has been working full-time since 1993 to track the spread of terrorist networks to our shores, even at great personal risk. In 1995, not long after the release of his PBS documentary "Jihad in America," he was informed by federal officials that a South African Islamist death squad had been dispatched after him, and told that he should leave his home immediately. Since then he has not maintained a home address, though he has continued to write and testify under his own name. With the help of a staff of researchers he has followed the terrorists' monetary sources, monitored their attacks and plans, exposed their ties tocharitable foundations, and assisted a variety of government agencies in the battle against them. He has obtained videotaped evidence of terrorist training camps and conferences, and tracked the international connections of American operatives to over a dozen organizations. 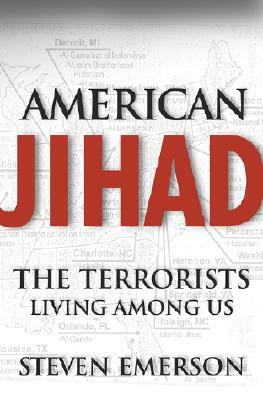 In "American Jihad" Emerson reveals the full story that only he knows. This is a frightening and crucial book for anyone who needs to understand the threat within our borders.